A plug and play post processed kinematic Georeferencing System that integrates with most cameras on most UAVs or manned aircraft. Your UAV will operate as it does now, with onboard flight control using the existing autonomous GPS. Unlike other solutions, KlauPPK is tightly synchronised with the camera shutter to ensure exact middle of exposure timing within 1ms and provide highly accurate camera positions at any speed. The plug and play kit includes the calibrated camera for DJI drones, KlauPPk box, GPS antenna and light weight hot swappable batteries. Easy to install and a simple procedure to capture accurate camera positions. A couple marks on the ground for camera calibration will enable lens errors to be managed. The logged data is processed after the flight with base station data from a survey grade GNSS unit or local CORS station. A base receiver can be supplied if required. The Klau PPK Geo-referencing Software offers simple yet sophisticated post-processing, creating high-precision camera coordinates, tagged to the photos, with lens calibration data to input into your photogrammetry software. With centimetre level camera positions and camera calibration, the mapping and modelling you produce will have the highest possible 3D accuracy. Dedicated, custom developed software for PPK post processing and extracting photo centres from post processed data. Software supplied free with hardware. Your choice of desktop software or cloud processing service. Process your photogrammetry as you normally would with the software of your choice. Import the results from your PPK processing as a table of precise camera coordinates or the precise geo-tagged photos with the coordinates written to EXIF. Need photogrammetry software? 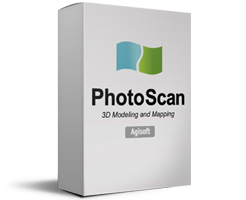 Buy Agisoft Photoscan from Klau Geomatics for expert support to get you up and running. Or use the 4DMapper cloud platform with access to Autodesk Recap Photo.